There’s fresh ink in the Lafayette athletics record books. The women’s 4+ crew rowing team beat 22 contenders representing schools nationwide in the American Collegiate Rowing Association (ACRA) National Championship in Gainesville, Ga. They are the champions: (L-R) Nicole Harry ’19, Julia DeFranco ’17, Carolyn McDonough ’18, Rachel Marbaker ’19, and Emily Smith ’18, led by head coach Rick Kelliher, named the ACRA Women’s Coach of the Year for the Mid-Atlantic Region. The women race the Anne Lacroce Linden ’88 in memory of the coxswain of the women’s lightweight 4 of 1988. The five-year-old boat has won more medals than any other in Lafayette history. 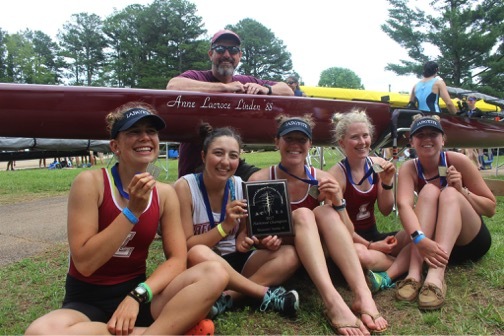 The team—Nicole Harry ’19, Rachel Marbaker ’19, Carolyn McDonough ’18, Emily Smith ’18, and coxswain Julia DeFranco ’17—had scarcely caught their breath since their last national contest. Two weeks earlier, on May 13, the Lafayette women stunned in Philadelphia by taking first place in the Dad Vail, the largest collegiate regatta in North America. Rowing through torrential rain, the fantastic four-plus-one bested 29 teams competing in the varsity open category, including many Division I NCAA powerhouses. The twin wins capped a spring season in which the Women’s 4+ climbed the medal dock six times—five of them to claim gold. Not a bad run for a club team barely out of the novice ranks. None of the five had rowed before college. From its tents and high-tech gear to the generous support of the Lafayette community, the 45-member, co-ed Crew Club gets to look, train, compete, and win like a varsity team. But technically, it isn’t. The difference between varsity and club rowing teams is the former’s NCAA membership, says Rick Kelliher, head coach of the Lafayette rowing team. Kelliher has coached both types of programs over his 30-year career. During the regular regatta season, however, the line between club and varsity blurs. Open events invite all eligible teams to race each other. The competition gets tougher. The 2017 Women’s 4+ is neither big nor strong. But what the athletes lack in physical stature, they make up for in mental toughness, mutual trust, and a shared sense of purpose. “What makes this crew so unique is their faith in each other. When a team succeeds at this level, a bond forms between them. It’s rare, but these [five] certainly have it,” says Kelliher. That bond feels like family. The men’s team provides brotherly rivalry. Kelliher and assistant coach Derek Richmond supply parental guidance. Meanwhile, devoted real moms and dads pull together with passionate crew alumni to ensure that Team Lafayette is well fed and funded. Even so, the crew life is not easy. Days start at the crack of dawn. Practices are long and exhausting. And free time is hard to find for student-athletes striving to achieve on both fronts. But for the disciplined who love a challenge, Lafayette Crew offers the experience of a lifetime—and just maybe, a national championship (or two). Congratulations!! A rare combo of teamwork, hard work, spirit, trust and friendship proves to create a superior 4+ team!! So proud of you all!!! Especially niece Rachel! Shows the value of teamwork and old fashioned determination. It’s great to see the program thrive. So proud of this amazing team, especially my niece, Carolyn McDonough. Congratulations! What an amazing achievement. For five women who started rowing only on the collegiate level, and not as juniors, I think this is unheard of. As a very old member of the rowing community, who started coxing at age 49, I tip my hat to this young crew. Best wishes for success again next year, ladies! Congratulations on an awesome season!! Their coach, Rick Kelliher, is a great match for Lafayette. The team won the ACRA’s by 22 seconds-most wins are in tenths of a second. The only teams that beat them all season were Stanford and University of Pennsylvania. Congratulations and looking forward to next season since all 4 rowers were sophomores and juniors. We alums from the ’80s are SO SO proud of this team! And they did it in Anne’s boat, which makes it even sweeter for us. Rick is right. The bonds you form when training like this are incredible. My boatmates are still my best friends. Talent, teamwork, discipline and a 4+1 goal, and, OK, a little extra pizza now and then–works every time and you proved it! So exciting! Trade the pizza for peanut M&Ms and you’ve captured these young women well! Wonderful, wonderful article about a wonderful team. Well deserved!!! Congratulations, team! Great achievement; we’re all very proud of you. Best wishes for continued success. I think this is the first time in the history of Lafayette that any crew team has won a national championship.